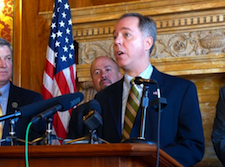 Wisconsin Assembly Speaker Robin Vos (R-Rochester), without notice or discussion with anyone other than his partisan allies, announced yesterday, the outline of the Republican campaign finance rewrite of the Wisconsin statutes, on the heels of announcing the destruction of the nonpartisan Wisconsin Government Accountability Board. Vos talked a lot about requiring more campaign finance reporting by candidates and his intention to double 40-year old contribution limits to candidates. That's relatively minor stuff. But what he glossed over, and was nevertheless forced to admit, was that the GOP plan will open up Wisconsin elections to permit campaign coordination between candidates and outside special interest spending groups. This has been prohibited for decades in Wisconsin, until the State Supreme Court in July said such coordination was permissible. That court decision, which is likely to be successfully appealed, is an outlier in the nation. No other federal or state court has ever gone as far as to say that such coordination was legal – not even the U.S. Supreme Court in the Citizens United decision of 2010. The practical effect of that decision and of this measure put forward yesterday is that contribution limits to candidates, even if doubled, become meaningless under the law. If you can now contribute $2,000 to a State Senate candidate and you can coordinate with that candidate's campaign by contributing or spending unlimited money on a phony issue ad communication (by just carefully avoiding the use of the so-called "magic words" such as "vote for" or "defeat" or "support"), then the $2,000 contribution becomes meaningless. And besides, why would you even make such a contribution, when it has to be disclosed, while the unlimited money you spend on a campaign communication masquerading as "issue advocacy" does not have to be disclosed under current law? The GOP "rewrite' further codifies into Wisconsin law that the source of funding for only express advocacy (magic words) communications must be disclosed. Phony issue ads can and will continue to escape reporting and disclosure requirements. And this measure apparently will allow unlimited contributions from a political party or a legislative campaign committee to a candidate for any state office. The other elements of the GOP plan are minor and of little or no consequence. The net effect of this plan is effectively the complete deregulation of campaign finance law in Wisconsin, including any meaningful transparency or disclosure. Much more money, in much larger amounts will flow. If this measure becomes law, Wisconsin elections will be inundated by unlimited outside money, likely most of it from outside of Wisconsin, and the vast majority of that money will be secret, with the source unknown. Wisconsin voters will be relegated to the sidelines and democracy will be further diminished. For more about this, go here, here and here. 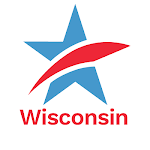 Partisan GOP Campaign Finance Plan Released Yesterday Effectively Ends Contribution Limits, Disclosure and Transparency in WI ElectionsTweet this!